This past week the owner of two portraits of Joanna by Mary E. Hutchinson contacted me through this blog. To see the paintings visit my digital catalog of Hutchinson’s work at http://meh.omeka.net . 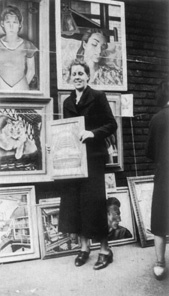 I knew about the existence of one of the paintings from this photograph of Hutchinson exhibiting at the 1934 Washington Square Sidewalk show in New York. The portrait of Joanna [in checkered shirt] is shown immediately above Hutchinson. However, the second portrait of Joanna [with pillow] is a completely new find! The model is Joanna Lanza who shared her life with Hutchinson from 1931-1935. Hutchinson painted multiple portraits of Joanna and her many sisters during this time. You are currently reading Recently Located – Hutchinson Paintings at Jae Turner.